Welcome to Fire Emblem Wiki! An online Fire Emblem encyclopedia that anyone can edit. With 6,336 articles and counting! This wiki contains spoilers. Read at your own risk! A new trailer for Fire Emblem: Three Houses from the February Nintendo Direct is now available. Super Smash Bros. Ultimate has been released for the Nintendo Switch console. Chrom gets his chance! He joins the battle in Super Smash Bros. Ultimate for Nintendo Switch, as an Echo Fighter of Roy! Fire Emblem: Three Houses, the next Fire Emblem series game for Nintendo Switch, has been revealed at Nintendo's E3 showing! Watch the trailer here. Congrats to PikaSamus, the wiki's newest administrator! 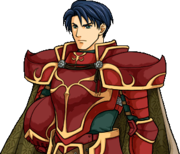 Zelgius (Japanese: ゼルギウス Zelgius) was a highly esteemed knight of the Begnion Empire, a servant to Chancellor Sephiran, and a follower of Apostle Sanaki's causes. As the general of the Begnion Imperial Central Army, the elite armed forces entrusted with the defense of the Begnion capital Sienne, he commanded the armies of Begnion in support of Crimea during the Mad King's War. Three years later, he and the Central Army led the rest of Begnion's forces against the Laguz Alliance, where he fought despite his own misgivings to prevent the treacherous senators of Begnion from harming Sanaki or Sephiran. Read more... Be warned, this article contains major spoilers! Fire Emblem Wiki needs a lot of help and assistance. Short articles that need expansion are in the Stubs category. Articles with incomplete sections can be found here. There are many articles that link to nonexistent articles. A list of these nonexistent articles can be found here. This page was last edited on 24 July 2018, at 17:14.